Arsenal fans may want to watch this Unai Emery video for an exciting glimpse into how highly he rates youngster Matteo Guendouzi. The French teenager has made a real impression for the Gunners since joining from Lorient in this summer’s transfer window, despite not arriving as the biggest name by any means. Guendouzi has shown remarkably maturity and quality in midfield in his first two games against Manchester City and Chelsea – quite a step up from the opponents he will have been up against in Ligue 2 last season. 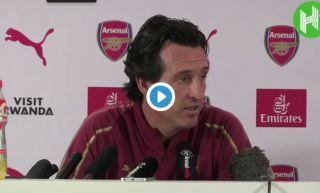 In this clip shared by Simon Collings, it’s certainly apparent that Emery’s eyes seemed to light up when asked about Guendouzi’s progress.